Elections Department’s former Questioned Documents’ Examiner P.H. 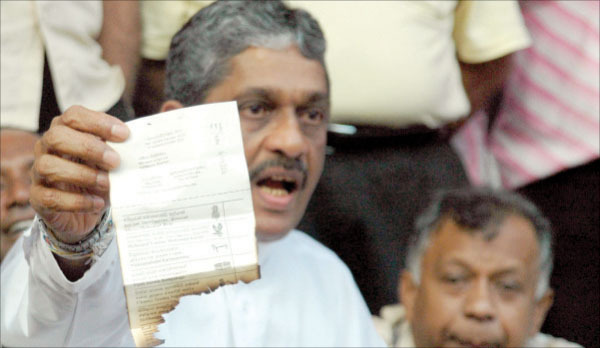 Manatunga has confirmed that the 62 ballot papers which were marked for common opposition candidate Sarath Fonseka at the last presidential election and found dumped near the Ratnapura Technical College were originals though the government had failed to conduct an impartial inquiry into the incident, it was revealed Thursday. According to the Daily Mirror,in the letter tabled in parliament Mr. Manatunga said he examined the ballot papers using analytical techniques such as ultra violet radiation, transmitted and oblique light. “I find that these 62 ballot papers are not photocopies. They are originals printed on security paper,” he said and added that the paper was off white in colour and each ballot paper was 38.9 centimetres by 11.4 centimtres and had the legend “Presidential Election 2010-Ratnapura District” in the three languages. He said security fibres are seen embedded in the paper whose serial numbers were mentioned in the letter. United National Party (UNP) Deputy Leader Karu Jayasuriya referred to this letter at the committee stage of the budget debate and said Mr. Manatunga who was now retired had confirmed that these were original ballot papers though the government initially denied it. Mr. Jayasuriya tabled a copy of this letter in parliament. “The government spokesmen said these were bogus ballot papers. Even the District Secretary denied it. But, today, the truth has come out,” Mr. Jayasuriya said. He also decried the government’s failure to constitute the Independent Elections Commission and the Independent Police Commission. He asked President Mahinda Rajapaksa to come to parliament once in three months and answer questions asked by the opposition as stipulated in the 18th Amendment to the Constitution. Mr. Jayasuriya reiterated the need to depoliticize the police and the judiciary. “In the name of the gods, I ask the government to stop the appointment of the heads of police stations on recommendations by ruling party electoral organizers,” he said.